Let’s tour my house for craftiness. I’m currently carrying a handmade purse. My purse means that I’m leaving the house, so I need to walk to my closet. 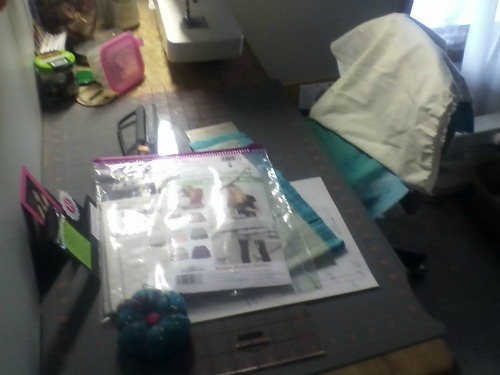 That means I’ll go by my sewing desk. I need to buy 1″ elastic for the waistband — I’m turning the “former long dress, now a short dress” into a skirt only. DD1 says she’ll wear it. Can you see my pincushion in the foreground? I think it’s cute. Then I pass through the hall to get to the closet. 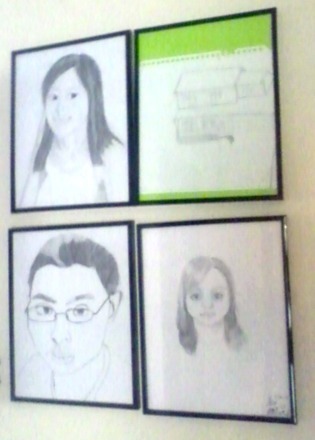 The kids drew self-portraits (they took for.ever. to finish) that I hung. “G” of GAIN chose to swap his stick figure boy in for our house. More about our house portrait in a later post. And then I have my cute flip flops. Now, I’m ready to leave the house! 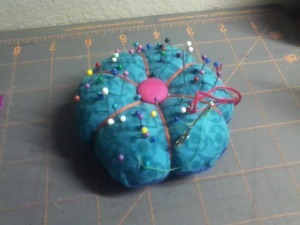 This entry was posted in crafting and tagged crafty monday. Bookmark the permalink. and chances are if you look in your purse…you’ll find more craftiness inside there as well!